foremost acute care medical center in the region. 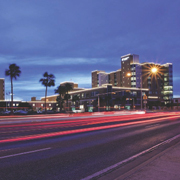 CHRISTUS Spohn Hospital Corpus Christi-Shoreline offers South Texans a full range of diagnostic and surgical services. The Pavilion at CHRISTUS Spohn Hospital Corpus Christi-Shoreline houses the CHRISTUS Spohn Heart Network, which was recently recognized as one of the top 100 cardiovascular hospitals in the United States. The Heart Institute offers the most advanced diagnostic, surgical and rehabilitative cardiac services in one convenient location. Located across the street from Shorelineis the CHRISTUS Spohn Kieschnick Guest House, a low-cost, 22-room, home away from home for people with family members in any of the CHRISTUS Spohn hospitals.